This Insulated Breastmilk Cooler Bag is made of 600D Oxford fabric for water-proof and easy to wipe clean, lining with padded insulation cotton and EVA for great thermal resistance to ratain breastmilk freshness. 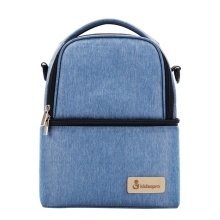 The Insulated Cooler Backpack exterior is made of 600D Oxford fabric for water-proof and easy to wipe clean. Breastmilk storage bag lining with padded insulation cotton and EVA for great thermal resistance to ratain breastmilk freshness. Two compartment design of this cooler bag can separate hot and cold food storage, separate electric pump and milk. Use this lunch tote with ice bag to keep milk, food, fruit cold. Perfect to transport breast milk from work to home or leave with daycare, bring lunch, go to picnic, etc.